The "Great Jubilee Year" is significant because it promotes an idea that extends well into the field of human rights. Pope John Paul took the first major step in fulfilling the objectives of the Great Jubilee by asking for the "Lord's forgiveness for the sins, past and present, of the Church's sons and daughters..." on March 12, 2000. His main message is summarized in this slogan: "Let us forgive and ask forgiveness!" He apologized for the sins such as violence against ethnic groups and peoples, treatment of immigrants and Roma people, genetic experiments on the unborn, abuse of minors, treatment of women, treatment of Jews, and treatment of followers of other religions and cultures. The Pope said that violence should no longer be used in evangelizing. One factor that facilitated this waging of war was that for most of the centuries the state remained synonymous with religion. The Crusades and Inquisition would not have inflicted such suffering if man had had the wisdom to raise a wall of separation between state and religion. He continues to pay for the absence of that wall. The Great Jubilee has likewise helped promote the idea of canceling debts of poor countries in order to secure their future. 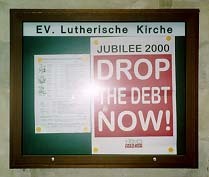 The idea of canceling debts spinned off an international movement that involves various churches and groups around the world. This movement is known as Jubilee 2000 Coalition. The meeting noted the need for HIPCs to accelerate the process of preparing "comprehensive and country-owned poverty reduction strategies through a participatory process involving civil society" as a means of maximizing the benefits of debt relief. Free trade system, the dominant economic framework in the world exemplified by the World Trade Organization (WTO), is compounding the situation. In tandem with globalization, the free trade system has been shifting wealth around the world much more quickly. But it also sustained divisions between the haves and have-nots. The widening gaps between rich and poor within nations, and the gulf between the most affluent and most impoverished nations are morally outrageous, economically wasteful and potentially socially explosive. It is reported that developing countries are against the inclusion of human rights (including labor) and environmental issues in the WTO talks. One reason is the fear that developed countries will use these issues to weaken the competitiveness of the developing countries. While this is a likely scenario in a free trade system, this stance conflicts with the view that human rights and environment should not be sacrificed in the name of economic development. Voices against globalization that favors richer countries and stifles development in poorer countries have been raised. Many non-governmental organizations argue vigorously against globalization. Their efforts contributed to the failure of the WTO conference in Seattle. They pointed out that both developed and developing countries cause the problems. The rapid diminishment of the powers of local and indigenous communities, states, and even nations to control their futures as economic and political power is transferred to global and transnational institutions. The acceleration of modes of economic development that give scant attention to issues of equity, or the health of the natural world, and that have already brought the planet to the brink of economic, social and ecological catastrophe. The reinforcement and expansion of the economic colonization of southern countries by northern countries, while widening the gap between rich and poor in all countries. A sharp increase in unemployment in both the North and the South, as work is increasingly mechanized and automated, as corporate farming and biotechnology replace traditional small-scale agriculture, and as corporate activity becomes more mobile, unrestricted, opaque, and unaccountable. Massive population shifts from rural to urban areas, with commensurate poverty, famine, ethnic friction, and degradation of living and working conditions and human rights. The accelerated invasion of the earth's remaining wilderness, bringing a loss of biodiversity, depletion of natural resources and the breakdown of the planet's life support systems, as is already evident in ozone destruction, global warming, loss of species and habitat, depletion of forests and oceans, and the loss of the lands and rights of native peoples. Worldwide homogenization of diverse, local and indigenous cultures, social and economic forms, as well as values and living patterns that reflect the efficiency needs of the new global monoculture; simultaneously, the homogenization of diverse landscapes, as they are transformed to suit the global market. The issues raised by Jubilee 2000 Coalition and the questions over WTO, IMF and WB are linked to a major human rights concern: existence of a social and international order in which rights and freedoms cannot be fully realized. This is the opposite of what Article 28 of the Universal Declaration of Human Rights provides. Debt relief will improve the situation for many poor countries. But as the Jubilee 2000 Coalition admits, it will not prevent future unjustified debts from getting incurred again. The only way is to review the present national and international economic systems that breed this problem. What measures should be taken to create systems that prevent abuse of power to incur debts? How will the needs of people (especially the poor) be addressed in a manner that respects their rights and freedoms? Poverty is a justification for human rights violations. Those who get unlawfully arrested, or tortured, or extra-judicially killed are most likely from the poorer sections of society. Those who receive little financial and social support are the ones who are already suffering from discrimination and other forms of human rights violation. Being poor or in a vulnerable situation therefore means being exposed to a variety of human rights violations. b. creation of enabling environment to realize human rights. How will these issues be treated in the context of Asia-Pacific? Asia-Pacific countries have not fully addressed the injustice raised by several well-publicized issues regarding indigenous peoples (including the Australian Aborigines), comfort women, and victims of human rights violations under previous authoritarian governments (in the Philippines, Indonesia, Thailand, Korea and other countries). The failure of governments to take full responsibility on these issues is reflected in the current Asian financial crisis. While the international financial system is equally liable for the crisis, governments tend to blame only the outside causes and fail to look at the critical defects in the domestic economic, social and political systems that likewise caused the problem. Economic development can lead to the eradication poverty if done with equity and justice. But the governments' doggedness to have prosperous societies at the shortest time possible allows human rights violations. In a highly competitive world, there is no room for dissent or care for the weak who cannot compete. This precisely leads to the objections to globalization. The argument that economic rights should be a priority over other rights is proving to be incorrect. The reported unrest happening in the rural areas of Thailand and China regarding development projects vividly shows how much negative impact is being absorbed by rural people. There are likewise reports of displacement of urban poor communities in many countries to give space for development/commercial projects. These cases show how unprepared governments and international players are in facing the negative consequences of development projects. Much of the abuse by international financial institutions, multinational business corporations and the governments regarding development projects stems from the violation of basic human rights. The failure to provide relevant information on the projects to the public in general and the affected (or to be affected) people in particular causes a host of problems - from corruption to sudden and sometimes violent displacement of people. It prevents people from protecting themselves against such violations. The low priority and support for the replacement of livelihood, or housing, and other social services such as health and education that people lose due to displacement caused by projects violates the right to social and economic security. The protests Indonesian farmers are lodging before the Indonesian government refer to claims about projects that were forced on them by the previous Soeharto government. They have long been suffering. They can claim their right to just compensation and other benefits only now. In the same manner, development projects that replace traditional means of livelihood such as shift from traditional fishing to fish farming eventually expose the livelihood to greater market fluctuations, and other problems. Failed fish farms leave behind damaged fishing resource due to loss of vegetation (mangroves especially) and use of chemicals for fishpond maintenance. The same can be said of lands that are converted to input-intensive farms or plantations. The poor are hardly protected against such risks. How will debt relief relate to these situations? Will it be able to help compensate for the loss suffered by people affected by the debt-supported projects? Will it be able to prevent these situations from occurring again? While these questions may exceed the coverage of the present debt relief program, they nevertheless stress the seriousness of the problems brought about by debt-supported development projects. Human rights principles therefore constitute an important component in discussing any debt relief program. These principles can apply in remedying negative impacts of debt-supported development projects, as well as in making funding systems for development projects accountable. The Great Jubilee Year, Catholic Diocese of Kyoto (Japan) (Kyoto, 1999). Frances Kennedy, "Pope confesses 2,000 years of Church sins (but makes no mention of the Inquisition)," The Independent, London, as reprinted in The Daily Yomiuri, March 19, 2000. The debt reduction framework is called Enhanced HIPC Initiative. Camdessus urges wealthy nations to recognize needs of 3rd World, The Daily Yomiuri, February 15, 2000. Editorial, The Hindu, February 21, 2000 New Delhi, India (as reprinted in The Daily Yomiuri newspaper). "Rich-poor division stalls UNCTAD trade negotiations," The Daily Yomiuri, February 16, 2000. "UN trade declaration falls short for poor nations." The Japan Times, February 21,2000; "Developing, industrialized nations clash at U.N. trade summit," The Japan Times, February 15, 2000. See Plantilla, Jefferson R. and Yokoyama. Masaki, Development and Democracy: Philippines' Quest for the Next Century, Occasional paper, HURIGHTS OSAKA (Osaka: 1997) for a discussion of the problems encountered by people who were displaced by port and coal-fired thermal plant projects in two provinces in the Philippines.